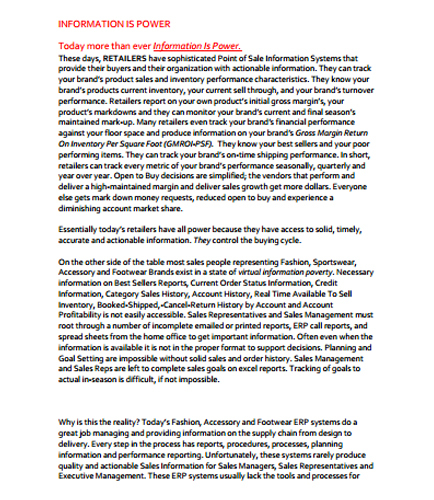 Why Information Is Power in Sales Force Management? "Why Information Is Power in Sales Force Management?" What is the strategic role of information in sales management? Essentially today’s retailers have all power because they have access to solid, timely, accurate and actionable information. All too often, executives and their sales force must navigate multiple complex applications or ask someone to produce reports and visualizations. Worse, the output is often too fragmented or complicated to interpret and use readily. What is sales force automation? What are the potential benefits of it? How to measure retail performance? What are the essential performance metrics that matter in retail jobs? What are the advantages of data analytics?